For more information on botanical name changes, check out this article from Kew Gardens. You have to read an article that includes a sentence like: "There are even whisperings of threats to lump Mahonia into Berberis. In this article, they note that Chrysanthemum was changed to Dendranthema. Are we to be without that crown jewel of the fall garden, mums? What should we call them? Emas? Apparently not. According to this article, "they" restored the "florist's chrysanthemum" to the genus Chrysanthemum, because it was "economically important". What does that mean? Does that include regular garden mums? 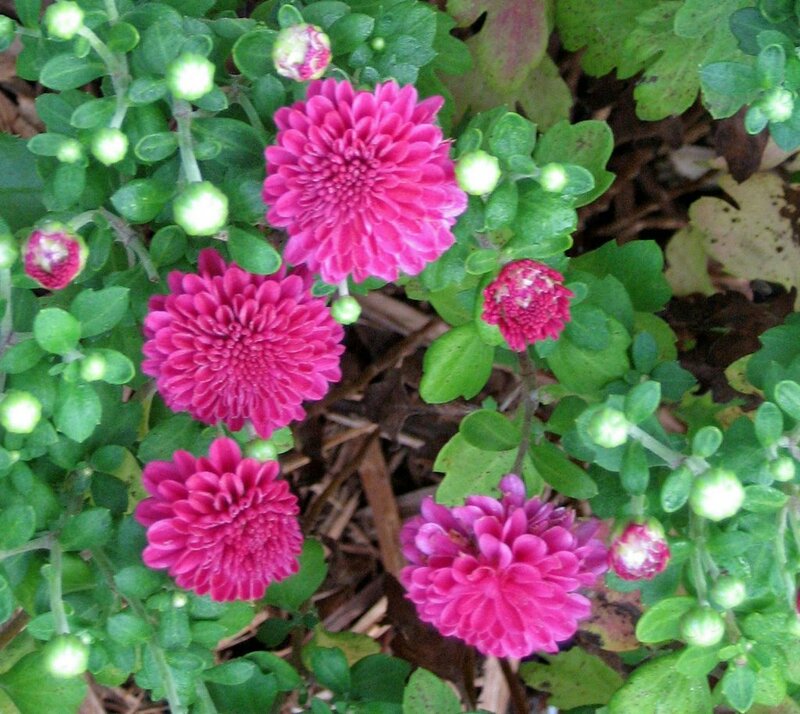 I'm sticking with "mums", regardless of what they change the botanical name to, because a mum is a mum. I've got a few mums blooming now; they actually started blooming a month or so ago. That's because I didn't trim them back around Memorial Day to make them bush out a little more before they set flower buds. I've included a picture of one above. I bought it from a co-worker who's daughter was selling them for a school fundraiser several years ago. Oddly enough, when someone's kid is selling plants or anything gardening related for a fundraiser, their parent always makes a beeline straight to my office. I also have some starts of a mum I got from my aunt this spring. She got them from my grandmother, who wrote all the diaries. I am growing them in pots on the back patio and will plant them out soon, and maybe share some with my sisters. I would hope that you would share them with your sisters. You might even convince us to do something for you. Carol, I have enjoyed your journal all summer. My daughter is a friend of your sister and your sister suggested I look at your site. It has given me much joy to see how you love your garden. I too have some of my grandmother’s lily of the valley and her daisy’s and sweet peas. All of them are special and I wait for them to bloom each year. I have a friend that lived next door to an elderly German lady and this is what she said about Mums. “Always pinch back your Mums in une & uly” ( silent J). We have always remembered that. I have some Baptisia, have you ever given anyone a start? I tried but could not seem to get it. Carol, I have enjoyed your journal all summer. My daughter is a friend of your sister and your sister suggested I look at your site. It has given me much joy to see how you love your garden. I too have some of my grandmother’s lily of the valley and her daisy’s and sweet peas. All of them are special and I wait for them to bloom each year. I have a friend that lived next door to an elderly German lady and this is what she said about Mums. “Always pinch back your Mums in une & uly” ( silent J). We have always remembered that. I also have baptisia and have tried to get a start fo rmy daughter but cannot seem to do it. Any suggestions? Kathy K - thanks for the nice comments. I think baptisia has a reputation for being difficult to transplant. I'd suggest sharing seeds, or trying to move seedlings that are very young.